Comic Cloud: Theracomics #1 on Comixology! The first issue is now available on Comixology, grab it now! 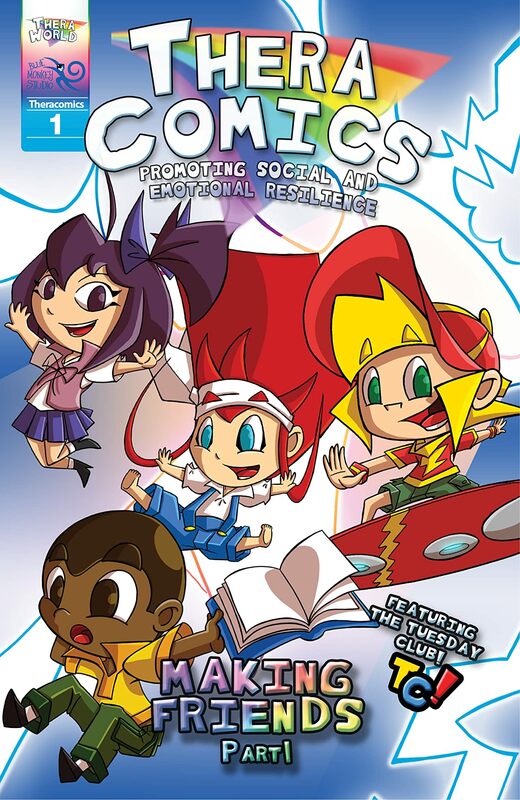 Theracomics use the many advantages of comics to teach social and emotional skills to kids. Being both visual and verbal they present social situations from several points of view, inviting readers to develop perspective and understanding. Kids get to 'try out' different responses through the characters while making connections with their own challenges. When read with teachers, parents or therapists Theracomics allow guided discussion and reflection to take place. Earth and Amaroo are the same planet, only in 2 different dimensions. While on Earth evolution took a wild turn, Amaroonians opted for a controlled approach improving their genes before birth. Both worlds are changed when kids form the two dimensions meet to create the TUESDAY CLUB! #1 collects the 1st part of the Tuesday Club! Story "Making Friends". It introduces the Club members Roy, Kathy, Madi and Harper as they meet for the first time, after having travelled to the mysterious Land of the Lost and Forgotten.